It has been a While!!!! I am looking to post more and participate in all the wonderful challenges and connecting with all the wonderful bloggers out there. I know it has been a while since I have posted a new card. But I will make up for the lost time. Work was really busy. .... It's funny how work sometimes get in the way of fun. I decided to create my own background. 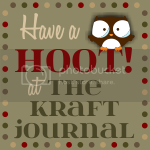 I used Just Rite pattern basic set stamp to create the background. Its actually on sale right now. 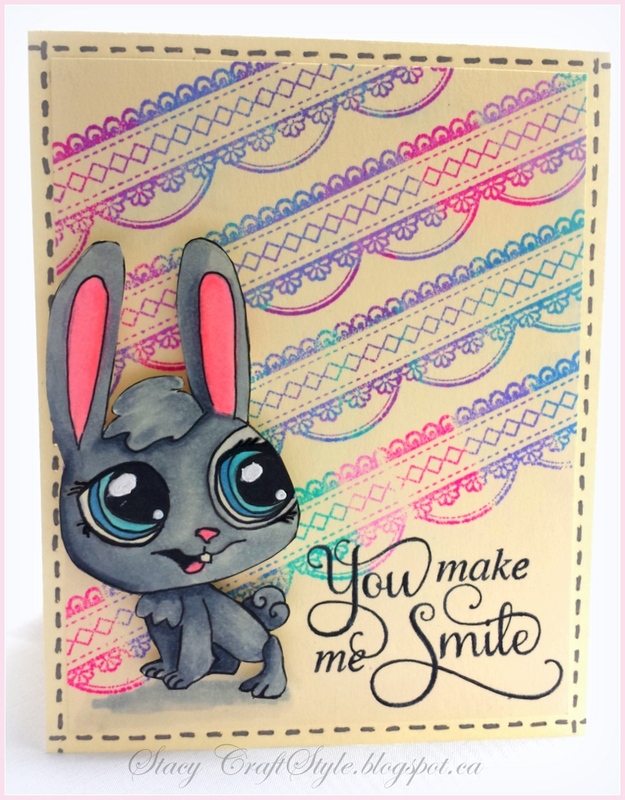 I love this stamp for those creations....I can do a lot with it. I added washi tape that was on my table. I actually not sure who it is by.. it's so long about I bought is. 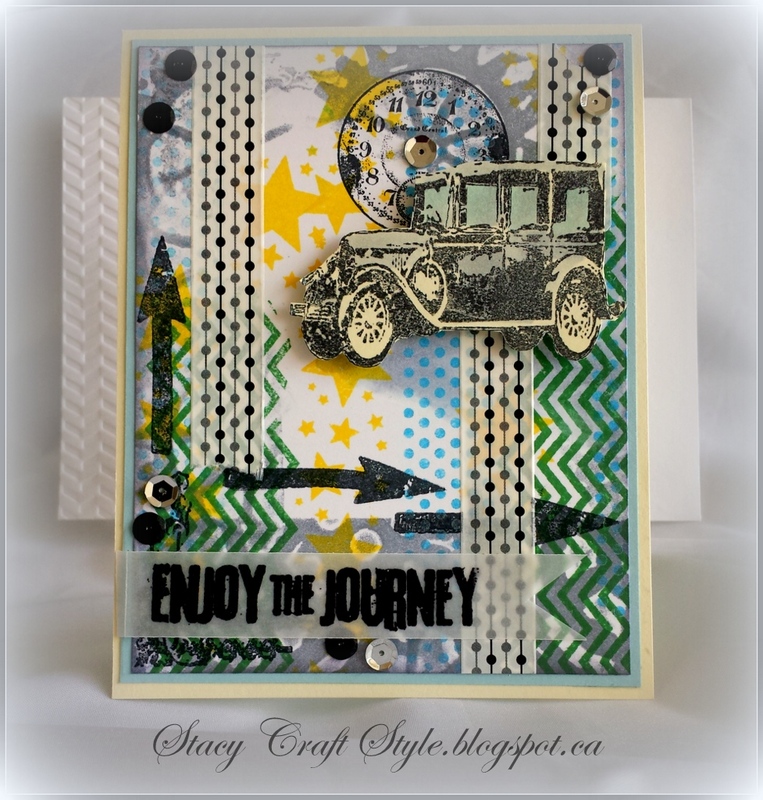 I used Tim Holts car stamp and enjoy the journey. I colored using Copics. I couldn't stop myself and added some sequence... I like shiny things. I needed to create quite a few thank you cards. So I used chalkboard technique to do so. This card is easy to replicate. I've started with creating a tag. This is the time I wished I had tag punch or die cut. 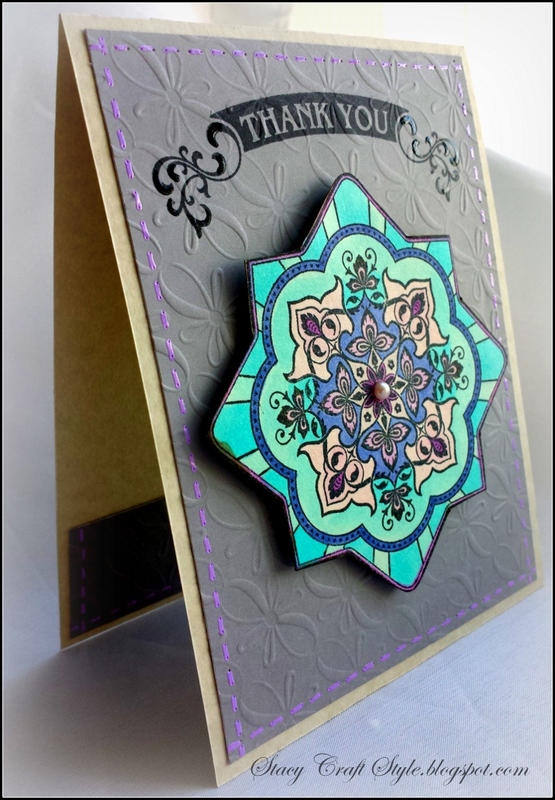 I have stamped and embossed the Just Rite greeting in the middle and then stamped again with white die ink. Because this ink takes forever to dry I smudged it all around to create that chalkboard look. I created white dash lines to pull it all together. 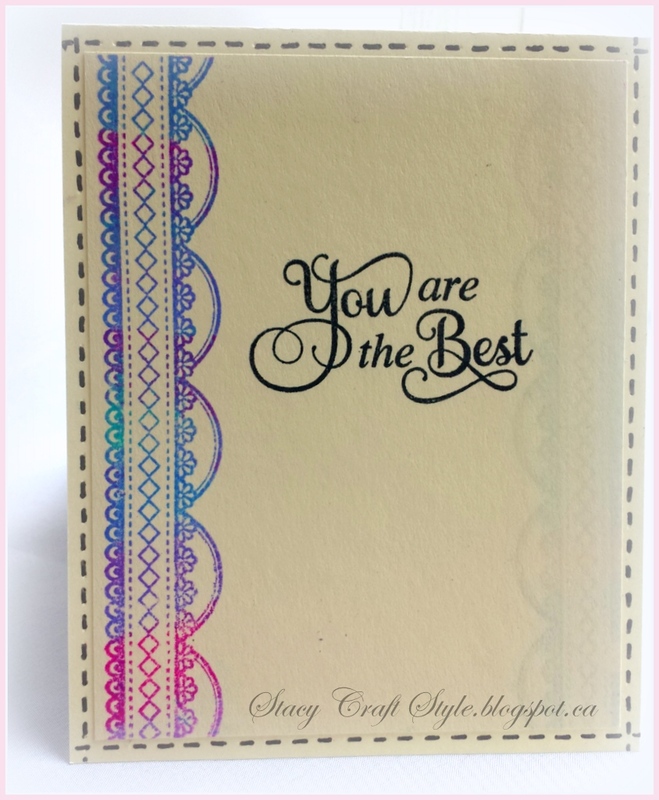 I used Stampin Up background stamp. I was trying to avoid Stampin Up but they had sale on... and how can I say no to "sale". The flowers I just pulled out of my hoarding box. This is the flowers that I bought at Wal Mart long time ago. I could've created my own flowers but I really need to use what's in my hoarding box. I couldn't decide which flowers look better. What do you think? I was loosing my creative mojo and I turned to my trusty YouTube for ideas. I looked at few different techniques but card in a box caught my attention. I am always fascinated by different card fold. I haven't try this one before so I decided to give it a go. I glued my panels to the card base and use seweasy stitch stamper. I am not a fan of this product but since I have it I will use it. I couldn't get a straight line.... so I gave up and made all the lines tilted. Let's call it a design :P I have out the box card together and I am ready to decorate. 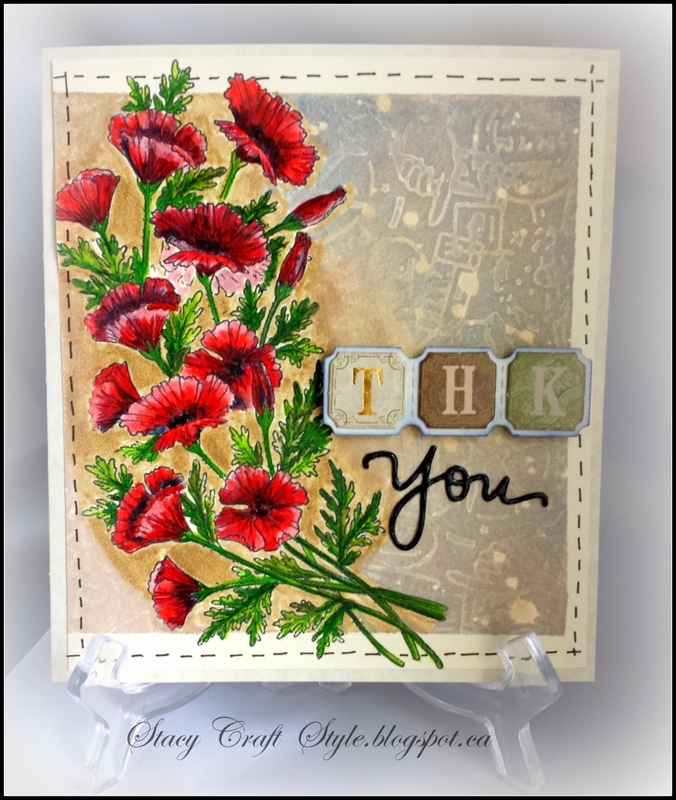 I have stamped all my flowers I used JustRite seeds of summer stamp... it seems to be my "go to" stamp for flowers. I did very and I mean very easy colloring. I just lay down a color and then used darker tone to highlight. I normally would spend hours on coloring perfectly and laying tons of layers of different shades and colors. Not this time. There were just too many of them. I fussy cut all of them and I have glued to the tabs inside the box. One thing I found that I had to check my positioning of the flowers to make sure that the card can still close. For the sentiment: I used thank you from Just rite seeds of summer and for the main quote I got it from affirmation ( "positive thinking") book. It says that if a person constantly see it and repeat it than the person would healthy. I thought what a perfect card to put it on. So I wrote it. The bonus to this card that I can close it and mail it easily. 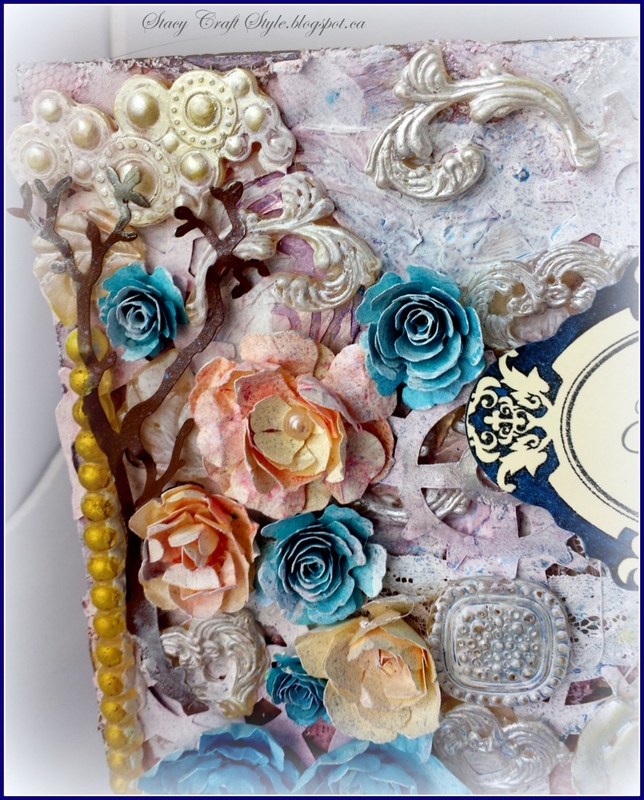 Although when recipient opens the card it would look like it has a lot of embellishments. There is tons of space to write on this card as well. That's it for this card. Any thoughts? There are 2 great things I found this weekend. 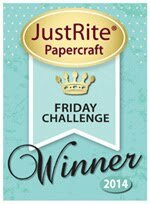 First I finally found 110 pound paper at Michaels and at 50% off I might add ( super happy). Second everything on kraft card stock looks so much better. This one was really... Really easy to make. 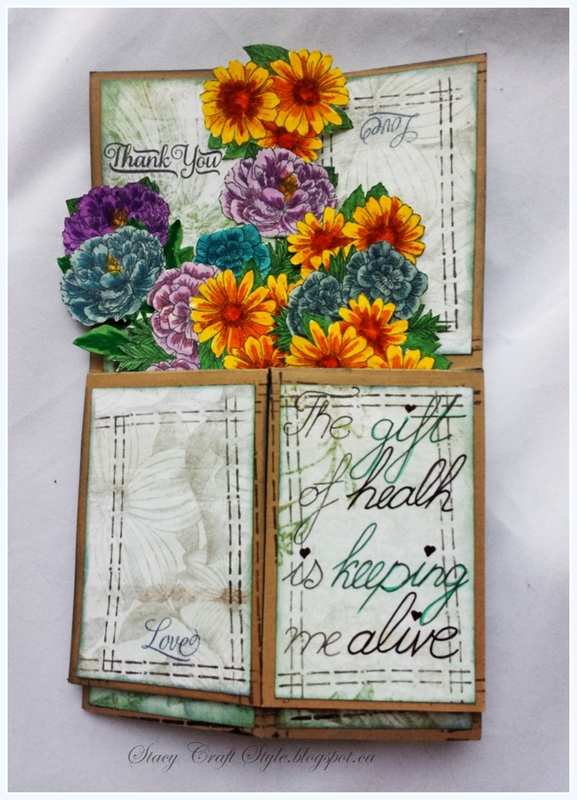 I started with kraft card stock, stamped Justrite stamps from seed of summer and sentiment. I then embossed it with the white embossing powder. I taped around the edges and used light pink ink to to add shading. The coloring on the flowers was really easy. 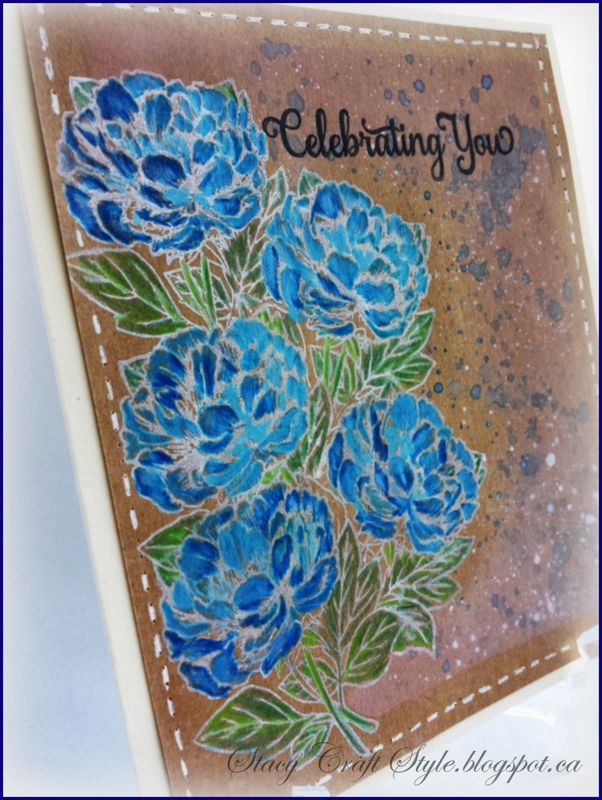 One blue marker from my stash, the embossing ink and kraft card stock did the shading for me. I have added faux stitched lines and the card is done. Really simple. If I ever decide to do tons of "thank you" or "note" cards this would be the design. I have created another card for the challenge. I have started with poppies set from JR. I have layered them and colored using inktense pencils. I love those pencils. They truly have a lot of pigment and tons of punch. 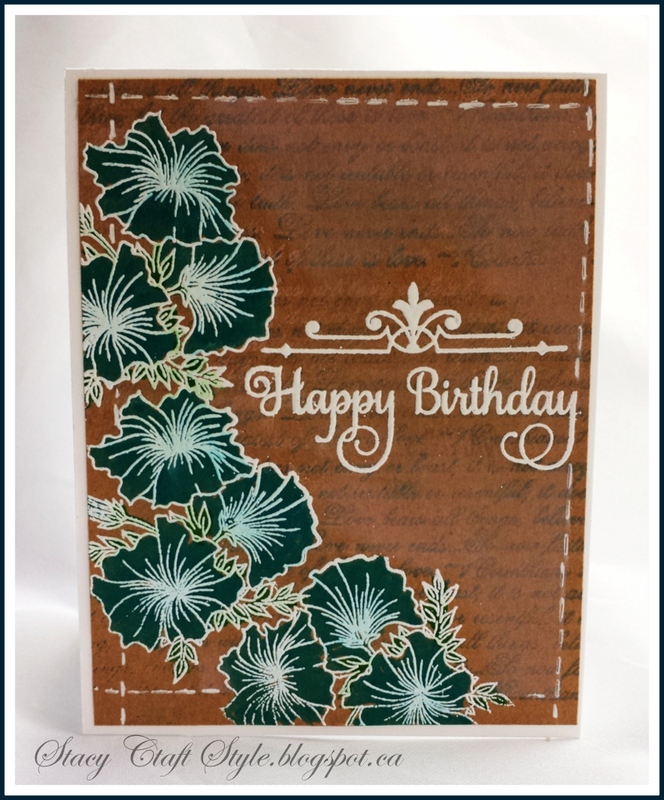 To create a background, I have made my own stamp from embossing folder. There is such a thing as magic stamp. Its a foam that when you heat it you are able to press the impression into it and it holds the shape. That's what I did. 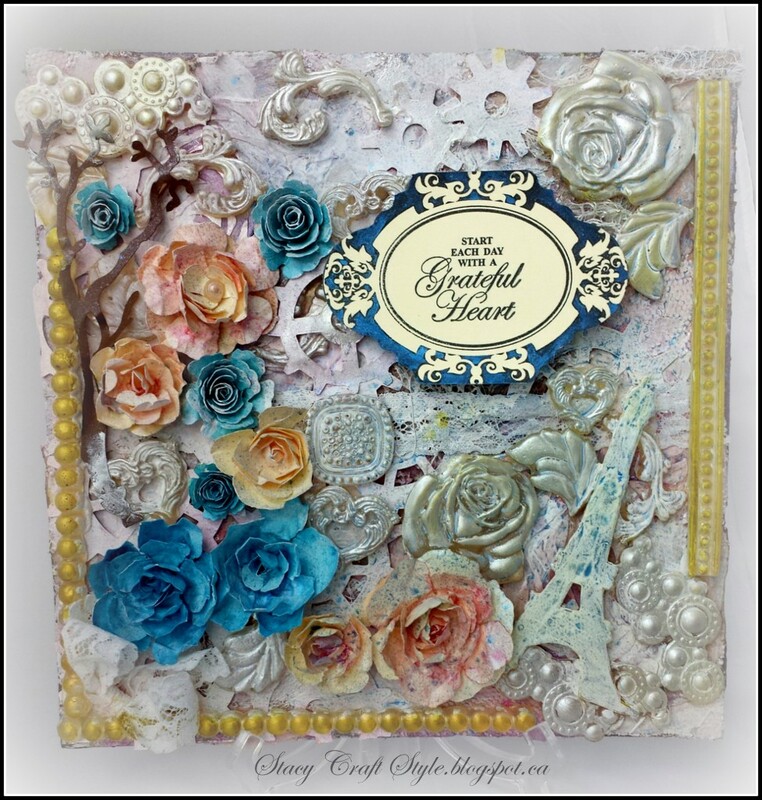 I heated it and pressed Tim Holtz embossing folder into it. I have mixed inks to stamp it. Before stamping the background I have taped the edges to create a border. I used distress market to color in white spots in this nice beige color. For the sentiment I have found couple letter stickers that I had laying around. I just bought new spellbinder's die with ticket stabs and those worked perfectly. 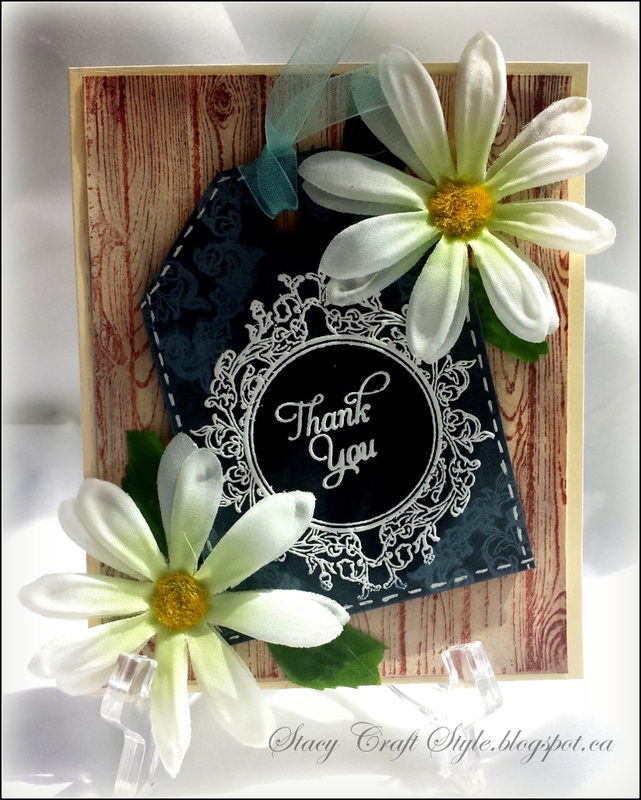 For "you" I have used Simon Says Stamp die cut and covered it with glossy accents. I've been very busy at work didn't have as much time to play with the last challenge. This new challenge I defiantly wanted to play in. I have started with the craft card stock. I created masks using JR stamp set * Seeds of Summer*. 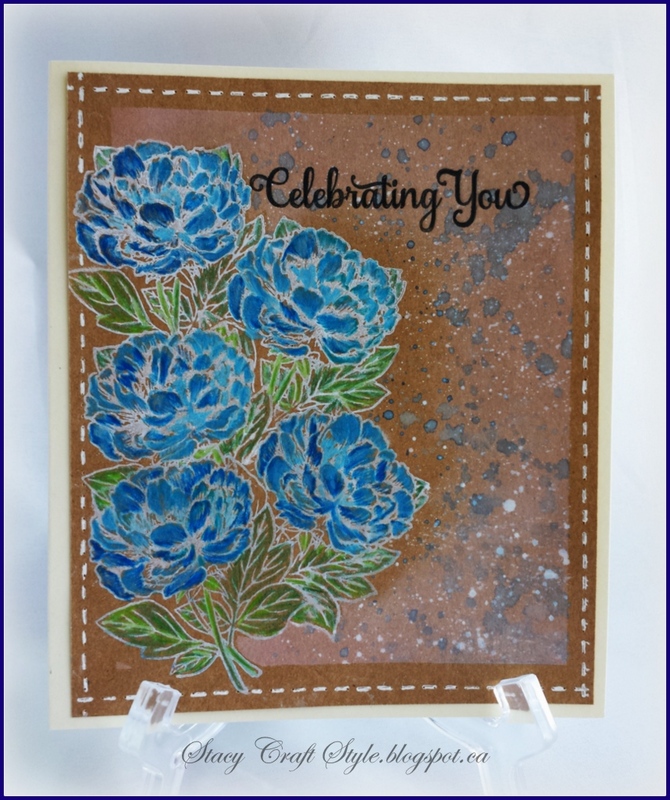 Using white pigment ink I 've stamped the flower few time. I had to wait in between the flower for ink to dry so I can mask it. For the flowers I've used soft color pencils to color the flowers and to add more shine to them I have used perfect pearls as water color idea. I have put some on my craft sheet and added powder. To create the boarder, I have used masking tape around the edges and inked with pale pink. I covered the flowers with the mask while I was doing so. I wanted to create so shadow around the flowers. I squished some white ink on my craft sheet, deluded with water and splattered the color all over the picture. I did the same with sapphire chipped distressed ink. I stamped sentiment when everything was fairly dry. I used my ink pen and carefully gone over the letters to make them bright. Used white gel pen to add the faux stitching and adhered it to the ivory card case. The card is done. I was trying to keep this card in clean and simple style. I couldn't figure out what image I can use. I didn't want to add flowers. I looked around my craft supplies and I found "my little pet shop" coloring book. I bought this coloring book years ago for when I was babysitting and I decided to use one of the characters. I want to make sure that I give the full credit to "my little pet shop" company for coming up with character concepts. Although they have borrowed it from Japanese style. If they have created stamps with the same characters I would buy them all. They are just are so stinking cute. I've started with trying to figure out the background. 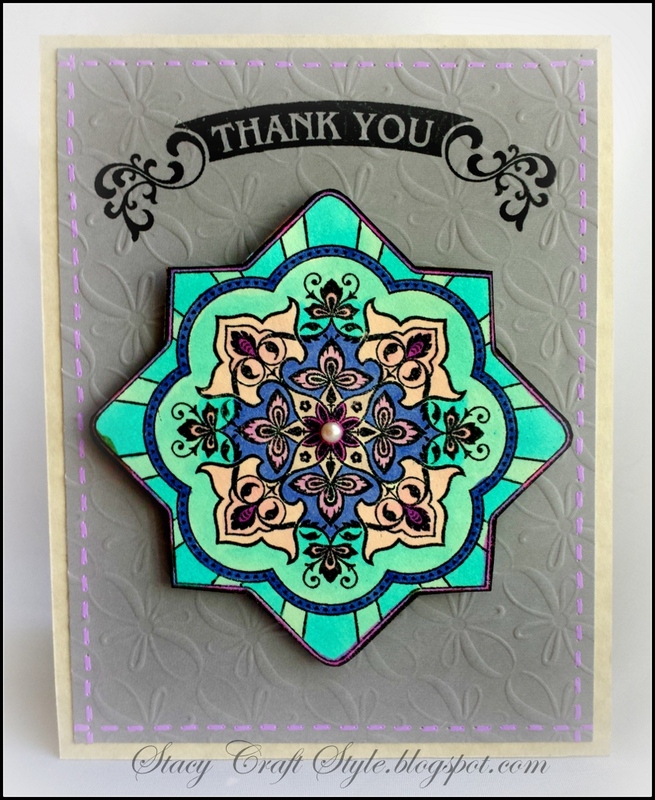 I have used Just Rite border stamp and kaleidocolor ink by tsuneko. It is pretty cool ink pad because it has all the colors together but they can be separated if needed. 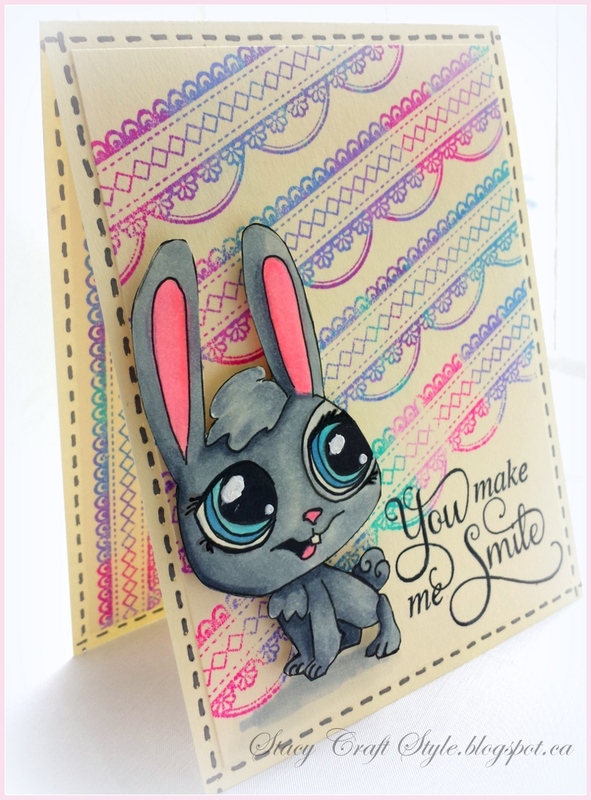 To create my little bunny I have re drawn image from the color book and colored it with Copics. I used primary C-0, C-3, C-5 and C-7. I know now that once I put copics over the pencil it's really hard to erase the pencil marks. I put my little bunny on the pop dots. darker color then what it actually will be. I like it because it gives a little puff. 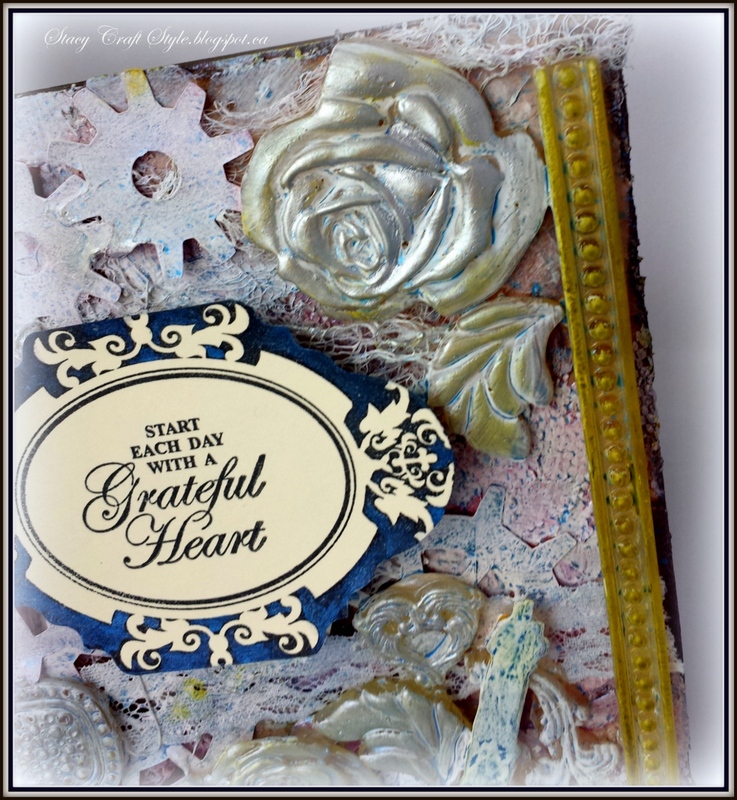 I used Just Rite Grand Sentiments for the sentiment inside and out. It seems that my work is taking a lot of my personal time. Don't have as much to create my cards. This card was created for CAS- JustRite Challenge. I am not the best at CAS card because I always feel that I need to add more. I have used pattern paper from recollection. It has little embossing. I used JR medallion stamp and colored with copics put on the pop dot. Used JR thank you stamp for greeting. I did faux stitching to tie the colors together. 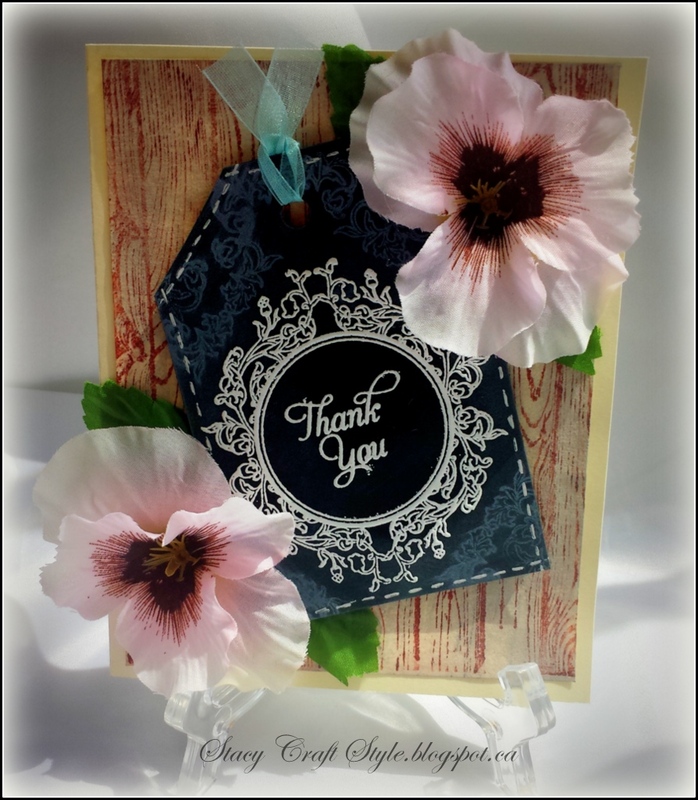 On the inside of the card I decided to add a little pocket for a gift card, since it is a "thank you" card. This is my first altered art. It was interesting experience. It took me a while to get this done. 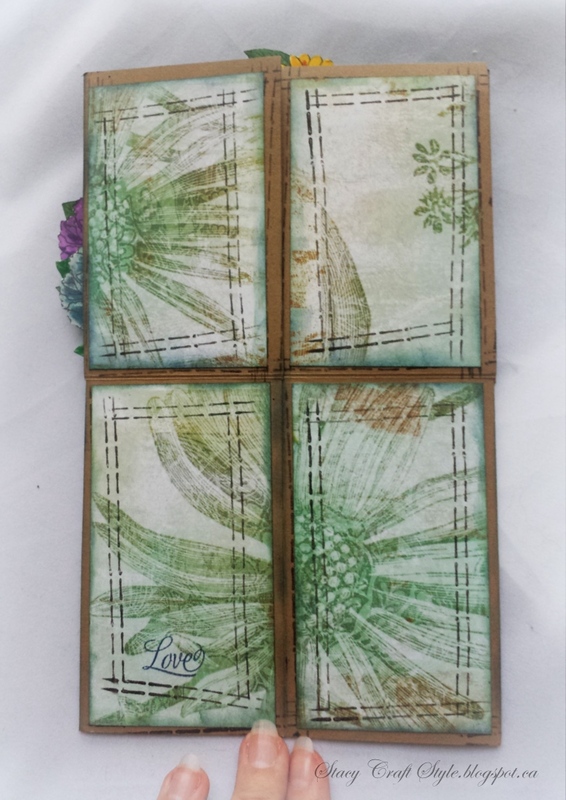 I've started with adding pattern paper and layering embossing paste with stencils. You can't really see the paper anymore. I am thinking I should have stopped with the embossing paste but it's all right. 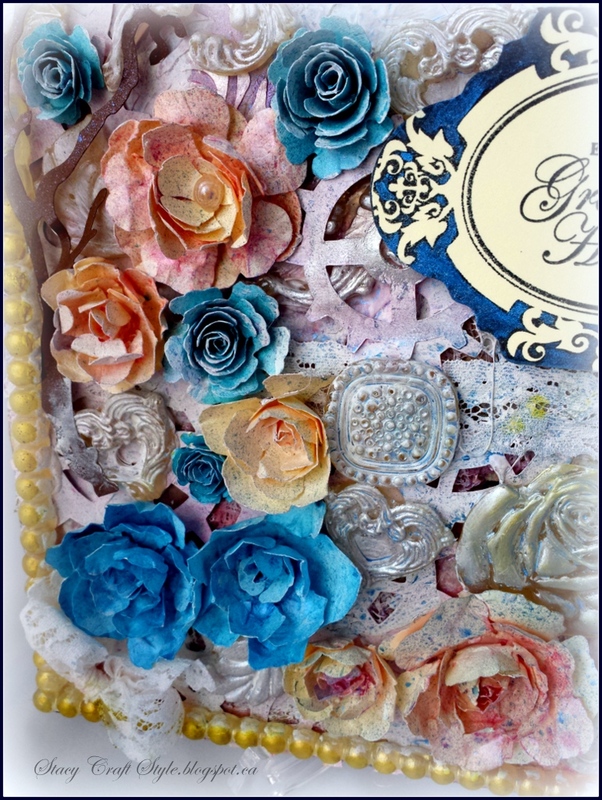 All the embellishments I have created using the molds and UTTE. 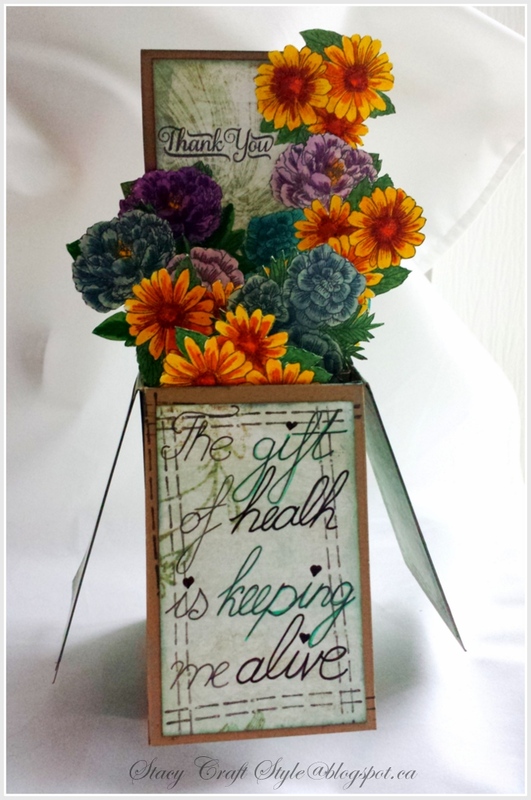 For the flowers I have used Cherry Lynn dies and Spellbinders. 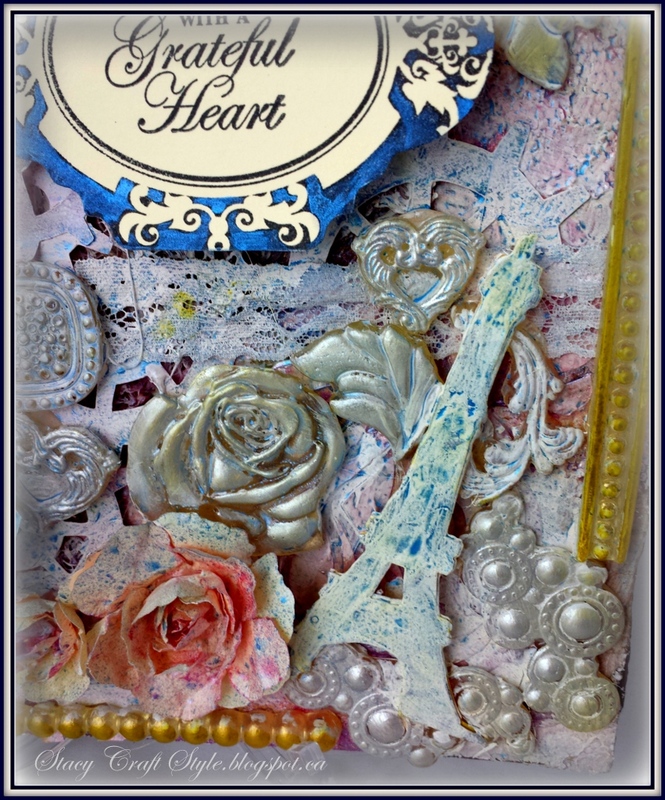 I used Tim Holtz dies for the gears and Effie tower. The toughest part was to put them all together that they would work well. After I glue everything down I used gesso to create unity.I have used mists to add color. I used the perfect pearl and pearl Ex mists that I have made. I used the silver rub on the raised portions to bring more attention to those. I used JR stamps to create the sentiment. That's it. My first canvas alteration is done.